Since the near meltdown of the global financial system in 2008, the economies of the G20 nations have struggled to recover. Some countries have had greater success than others in their quest for sustainable growth. Not surprisingly, business aviation took a direct hit when the financial storm broke six years ago. Corporations reacted by reducing the number of aircraft operated, deferring or cancelling airplanes on order, and shuttering flight departments. An effective way to gauge the damage inflicted on the industry is to review the number of corporate jets that have been produced during the past six years. To that end, Wings has assembled data published by the General Aviation Manufacturers Association of Washington, D.C. in the accompanying table. To simplify the exercise, we’ve placed the types of aircraft produced into two categories: A – large cabin, and B – very light jets (VLJ) through to Super Mid-Size (SMS). The numbers show that not only has there been a significant decline in the production of business jets after the crisis began, but that there has also been a shift in interest towards the larger more expensive models. During 2013, eight manufacturers produced 678 business jets. That represents a 40 per cent decline from the 1,153 units built by nine OEMs in 2008. The number of smaller cabin jets (VLJ-SMS) produced declined 60 per cent from the 830 built in 2008 to the 342 made in 2013. The annual output of large cabin jets actually increased four per cent from 323 in 2008 to 336 in 2013. As a percentage of total units built, large cabin aircraft have increased from 28 per cent to 50 per cent. Through the first three quarters of 2014, the smaller jets were making a small comeback – representing 53 per cent of the 460 jets built during the first nine months. Is the trend towards larger business aircraft about to continue or reverse? That remains to be determined. Bombardier Aerospace, with product offerings that range from the light category through to the ultra-long range class, is expecting a rebound amongst the smaller models over the next two decades. Its “Business Aircraft Market Forecast 2014-2033” states that during that period, “the large category will generate a total of 5,250 deliveries, representing 24 per cent of overall industry unit deliveries.” This would suggest a return to a production mix not seen since prior to 2008. In the meantime, the three leading manufacturers of large cabin corporate jets have listened to their respective customer advisory committees and have been creating new models to meet the market’s evolving demands. The key criteria driving these new designs are: larger cabins, greater cruise speeds and increased range capabilities. The performance and pricing details provided below are all preliminary. With almost 700 members of the Global family (including the Global Express, Global Express XRS, Global 5000 and Global 6000) having departed the plant in Toronto, Bombardier is the second largest producer of long-range business jets. The company is developing two ultra-long range models that are intended to meet the requirements of passengers who have globe-girdling itineraries. The largest cabin of any purpose-built corporate jet will provide four zones. Maximum range of 7,300 nautical miles (NM) at normal cruise speed of M.85. That represents a 22 per cent improvement over Bombardier’s current flagship, the Global 6000. When time is important, it is expected to fly 5,100 NM at its max. cruise speed of M.90. Timing: First flight expected in 2016, deliveries that year. Observation: The 10 per cent less expensive G650ER will have a 200 NM greater range than the Global 7000 when cruising at M.85 and a 1,300 NM advantage when clipping along at M.90. For those who prefer more space to speed, the Global 7000s larger four zone cabin may be the feature that will keep current Global operators within the Bombardier fold when they upgrade. The longest range of any purpose-built corporate jet, with the anticipated ability to travel 7,900 NM at a normal cruise speed of M.85. At the max. cruise speed of M.90, the projected range is an impressive 5,650 NM. Timing: first deliveries are expected in 2017. Observation: While the Global 8000 will have a 400 NM range advantage over the G650ER when cruising at M.85, the G650ER will outrun the 8000 by 750 NM when sprinting at M.90. Having produced approximately 260 of its top-of-the-line Falcon 7X, the company has launched a pair of new models aimed at the upper tier of the business jet market. A cabin height of 6′ 6″, the tallest in the industry. Range of 4,750 NM at M.85, or 5,200 NM at M.80. Top speed of M.90. Timing: First flight is expected in the second quarter of 2015 with deliveries initiating during the first half of 2017. Competition: Bombardier Global 5000, Gulfstream G500 and Dassault Falcon 7X. Observations: Compared to the 7X tri-jet, the new 5X twin will have a 14 per cent larger cabin and 19 per cent more available thrust. Although it will have a 13 per cent shorter range than the 7X, its purchase price is expected to be about 15 per cent less than the 7X. Like the 5X, the Global 5000 can fly 5,200 NM, but it does so at M.85. With a cabin that is similar in size to the 5000, expectations of greater fuel efficiencies and an eight per cent lower list price, the 5X should provide an interesting value proposition. The Gulfstream G500 could prove to be the key competitor to the Falcon 5X. With a similar sized cabin, the G500 is expected to fly 250 NM further than the 5X at M.85 and is to be priced at $43.5 million versus $45 million for the 5X. Continuing the tradition of Dassault’s flagship models, the new 8X will have three engines. This is a feature that some owners, as well as their passengers, favour. Range of 6,450 NM at M.80, a 500 NM (8.5 per cent) increase over that of the 7X. Top speed of M.90. Timing: First flight is expected in the first quarter of 2015, with deliveries beginning during the second half of 2016. Competition: Bombardier Global 6000, Gulfstream G600 and Dassault Falcon 7X. Observations: The maximum range of both the Global 6000 and the Gulfstream G600 come close to 6,450 NM of the 8X (6,000 NM and 6,200 NM, respectively), however, they can cover those distances at M.85. Given that the 8X is expected to list for $58 million, compared with $62 million for the Global 6000 and $54.5 million for the G600, it will be interesting to see how the market ends up being divided among these three types. Since the first flight of the Gulfstream II 48 years ago, the company has been the premier producer of large cabin long-range corporate jets. In the ultra-long range segment, it has delivered 193 Gulfstream Vs, approximately 470 Gulfstream G550s and almost 100 G650s. The company is aiming to maintain its significant share of the most prestigious niche of the business jet market with the addition of two seventh generation Gulfstream models to its product line. A new flight deck with touch screens and active control side sticks. Range of 5,000 NM at M.85, or 3,800 NM at M.90. Max. operating speed of M.925. Timing: First flight due in 2015, with deliveries beginning in 2018. 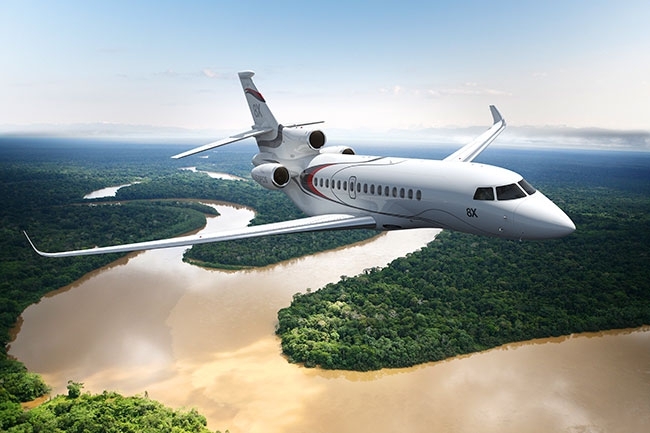 Competition: Bombardier Global 5000, Dassault Falcon 5X. Observations: While the G500 will have a slightly smaller cabin than the Global 5000, it is expected to have a 10 per cent lower purchase price than the GL5T. The G500 will fly five per cent further than the Falcon 5X and is priced about three per cent less than the 5X. Expect keen competition between these three models. Same new flight deck as the G500, providing type rating commonality. Range of 6,200 NM at M.85, or 4,800 NM at M.90. Max. operating speed of M.925. Timing: First flight expected in 2016, with initial deliveries following in 2019. Competition: Bombardier Global 6000, Dassault Falcon 8X. Observations: The G600 is expected to have a list price that is 7.5 per cent below that of the Global 6000 and six per cent less than the Falcon 8X. As well, the G600 is forecast to have a three per cent greater range than the Global 6000 at M.85. While the 8X will have a four per cent greater range than the G600, it will only get that far by cruising at M.80. These six new models promise to bring more to the corporate aviation arena – specifically, more comfort, higher speeds and greater range capabilities. While potential buyers will compare cabin sizes and interior layouts, block times on frequently travelled routes and the improved abilities to connect distant points on a map, other criteria will be assessed in making a final purchase decision. Operational reliability, AOG support and the considered opinions of both influential passengers and flight crews concerning a particular airplane’s design (inside and out) are other factors that often influence the selection of a particular model. A dynamic that figures into the competitive landscape of business jet sales is brand loyalty. Atop the list of purpose built corporate jets is the Gulfstream G650. It is not only the fastest large cabin jet, but also flies the furthest and costs the most to acquire. Ever since the first business jet flew in September 1957, demand for these “time machines” has grown. Despite anemic economic conditions, geopolitical tensions, terrorism and epidemics, the number of corporate jets in service around the world have continued to expand decade after decade. As the need for international travel has increased, so have the range capabilities of business jets. These six latest examples of innovative aeronautical design will represent another generation of aircraft that reflect the advancing requirements of their customers.